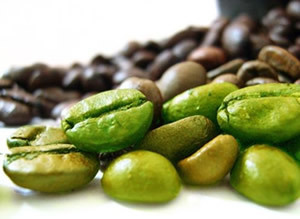 Home » Green Coffee Bean » Are Green Coffee Beans the Answer to Weight Loss? Green coffee bean extract is the new kid on the block where weight loss supplements are concerned. It is touted by Dr. Oz as an effective way to burn fat without changing your lifestyle. He did his own trial on green coffee bean extract and provided evidence of weight loss in each of his subjects. So how does this supplement work to burn fat and help people lose weight? Green coffee beans are beans that have not been roasted like the ones we see at the local supermarket. When they are not roasted, they are found to have a higher content of an element called chlorogenic acid. It is thought that this chemical is what provides the health benefits in green coffee bean extract. It somehow manipulates the body to regulate its blood sugar and metabolism to lose weight. Caffeine is another ingredient in the bean that plays a part in weight loss in this product. A study by the University of Scranton in Pennsylvania involved 16 test subjects taking the green coffee bean extract in varying doses over a period of 22 weeks. Each dose was given 30 minutes before each meal. They were told not to change their eating habits or activity from the norm. The results were they lost on average 17 pounds, or approximately 10 percent of their total body weight. Many of the participants experienced a 16 percent decrease in total body fat. It was determined that the subjects consumed around 2,400 calories a day and burned about 400 calories with activity. This is impressive because that many calories consumed each day usually will not show any weight loss under normal circumstances. As a side benefit, green coffee bean extract has been found to be effective in reducing hypertension because of its concentration of chlorgenic acids. It is believed these chlorogenic acids facilitate improved blood vessel function that in turn improves blood pressure. You may also experience better blood circulation. So it is possible by taking green coffee bean extract that it may help prevent many diseases related to poor arteries such as heart and brain disorders. Be sure that you check the label when you purchase green coffee bean extract. For weight loss, it is generally recommended to take a dose of 200 mg to 400 mg, three times daily. This will provide a total daily dose of 600-1200mg. Take note of the serving size. For example, if the serving size is two capsules, then the amount of extract in each capsule will be half what is listed in the supplement facts panel. Next look at the number of capsules in the bottle. Make sure there is really enough for a 30 day supply. If you need to take 6 capsules per day to get an effective dose, and there are only 60 capsules in the bottle, it wont last very long. It should contain at least 45% chlorogenic acid, which may be listed as either GCA(green coffee antioxidant) or Svetol®. If you don’t see this on the label, don’t buy it. Ensure that the product is pure and there are no fillers, binders, or other inert ingredients. Green coffee bean extract is a powerful tool in your weight loss management, especially when combined with low-fat meals and moderate exercise.